In 'Epic' Rematch, Djokovic Is Bounced Out In Australia : The Two-Way The three-time defending champion lost to Stanislas Wawrinka in another five-set thriller. Djokovic joins other familiar names who have been beaten Down Under. They include Serena Williams and Maria Sharapova on the women's side. 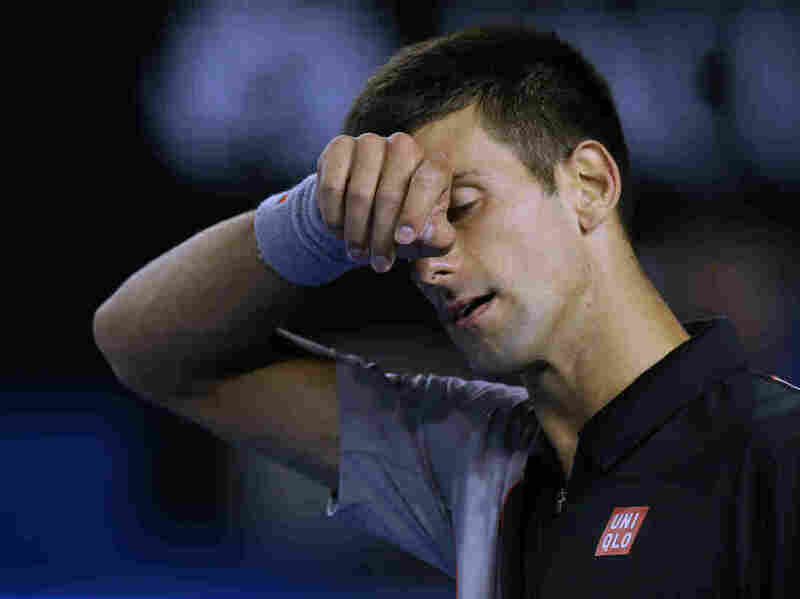 Three-time defending champion Novak Djokovic of Serbia is out Down Under after losing in five sets at the Australian Open to Switzerland's Stanislas Wawrinka. Tuesday night's set-by-set score in Melbourne: 2-6, 6-4, 6-2, 3-6, 9-7. "Epic" seems to be the word headline writers have settled on to describe the match. Or rematch, if you prefer. "With things knotted up at 7-7, a serious case of deja vu hit the Melbourne Park faithful as they casted their minds back to last year's epic fourth-round, 22-game final set. ... When Djokovic sent a forehand volley long at 30-40, Wawrinka could finally celebrate reaching the semi-finals after a gruelling four hours on court." Djokovic's exit from the tournament is the latest by a familiar name. On Monday, as The Associated Press writes, "Maria Sharapova joined Serena Williams on the fourth-round casualty list" among women. Those who remain, however, include Rafael Nadal, Andy Murray and Roger Federer on the men's side. On the women's side, 19-year-old Eugenie Bouchard of Canada has reached the semi-finals in her first appearance at the open. Her next opponent is two-time finalist Li Na of China.